As I left the subway station that morning in April, I reached the bottom of the stairs and stepped out into the sun. It was earlier and colder than I was used to; barely past 10:30 in the morning, maybe 60 degrees. But the crowds were gathered anyway, and I joined them in line. There were lines outside Citi Field, actual, longish lines, the first ones I’d ever seen this early before a game. You could sense the love in the line, and the joy. Two pin enthusiasts were comparing collections behind me, and sharing stories of hard-to-find pins. “So they said, ‘it’s one of those pin guys,’” one told the other, “and they sent me up to the top level, they said they had a few more up there.” He pointed to a pin on his heavily bedecked lanyard. He was also wearing a hat covered in pins, over a hat without any pins at all. “You think they let me in with this?” the other asked, as he pulled out a plastic bag full of pins. They talked about that for a while, but didn’t settle on an answer. They opened the doors eventually, and I had two hours to kill before first pitch. I spun the inaugural Mets Prize Wheel, and ate a grilled cheese with steak from a brand new concession stand. Then, long before game time but with nothing else to do, I took my seat, first base side of home plate in the upper deck, and waited. A bearded man across the aisle from me asked if I’d be sitting in these seats all year, and I told him, unfortunately not. Finally, the teams took the field for introductions, and it was everything I’d dreamed of. The red, white, and blue bunting hanging off the stands; the logo, the same as the one on the pin and commemorative ball I’d bought, spray painted on the grass; Howie Rose at the podium in the middle of the infield. There was Daniel Murphy, the perennial solid hitter. There was Jacob deGrom, coming off his Rookie of the Year award, getting ready to start. And of course, there was the captain, ready to do what he’d always done, and play ball. It was a textbook 2015 Mets performance; a combined shutout, a Familia save, a few runs eked out on sac flies and singles. After Familia shut the door, I took the subway home. Then I wrote the first home game recap in Shea Bridge Report history. We all remember what happened next; the thrilling early-season winning streak, the slide into mediocrity, the trading deadline pandemonium that left us without Carlos Gomez but with Yoenis Cespedes, the climb into first place, and the drive to the World Series that braked a few days too soon. But I remember that day, Opening Day of 2015, in particular. It’s not every day, after all, that a passionate love affair begins. Things tend to get lonely during the offseason, especially if you don’t have much of a team to look back on. It’s six months without so much as a glimpse of the team we love, getting by on scattered tv appearances, the occasional media announcement, and lots and lots of twitter. Being a Mets fan isn’t quite comparable to a love affair; it’s more like a long distance relationship. Six months on, six months off, being apart for far too long, and sometimes, really hard to manage, but nevertheless, worth it all the while. 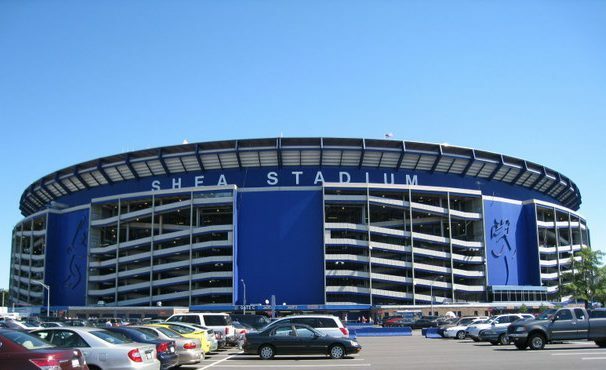 I’d loved the Mets before 2015, obviously; I’d loved the Mets since around noon on April 18th, 2004, when my little league bus pulled into the Shea Stadium parking lot and I saw the building in all its royal blue glory for the first time. But things changed in 2015. The love became different. I was thinking differently about the Mets, and I was writing differently too. Suddenly, I was one of those baseball philosophers. Baseball was everything; baseball was love, joy, childhood, America. The whole lot. Of course, it didn’t hurt that the Mets were winning, and winning a lot. No matter how it ended, the 2015 season was the best one I can remember, and maybe the best one of my life. I’m nowhere near old enough to remember 1999 or 2000, but I can’t imagine either of them topping 2015 by a substantial margin. But it wasn’t just the winning that changed things; my life changed too. I played my last season of competitive baseball (“played” is too generous a word; I had three at-bats and played a few innings at first base), and wrote about my first. I went off to school, and started taking writing classes: I read John Updike and Hunter S. Thompson, and outside of class, I read Roger Angell. Then 2015 turned to 2016, and the Mets weren’t quite as good, but they were still a helluva fun team to follow. That September, I went off to school again; as I was on the treadmill on my first day, I heard Matt Reynolds, allegedly coming off a series of plane rides and only 45 minutes sleep, hit a home run against the Reds to lead us to a crucial win in our pursuit of the wild card. Of course, it was a wildcard we’d go on to lose in excruciating fashion, but nevertheless, it was another easy team to love. We should have been in the World Series again in 2016. If we’d beaten the Giants, we’d surely have beaten the Cubs and their paltry bullpen, then the Dodgers, who we’ve proven we can beat, then the World Series…but we didn’t. So it was the Cubs who were playing game four of the World Series on Saturday, October 29th, 2016. It was a blowout. The Indians took the lead in the top of the second, and didn’t look back. But later that night, out for burgers, one more thing happened that changed the way I thought about life and baseball. Across the cafeteria, I saw a girl in a dress that immediately caught my eye. How I found out who she was is a long story; given how many times I’ve been made to retell it, I’ll save it for later right now. But later that week, we started talking. And naturally, my mind turned to baseball. She wasn’t much of a fan, it turned out. Didn’t know the game too well — but she knew what she knew. She knew about Justin Verlander. She knew that the World Series was going on. She knew that Bartolo Colón was ugly, because I sent her a picture and she laughed out loud. We met in person for the first time the next weekend, and saw each other every day. Soon enough, we left for Winter break. One night over the long vacation, she sent me a message. And I realized that I’d fallen in love for the second time in my life. “Cause I’ve been in love before // and I’ve found that love is more // than just holding hands,” go the lyrics by the greatest band of all time. So the question is: what is love? It’s hard to define, probably for a reason, and a good reason at that. It’s different for different people, as it should be. But there are some things it always does, or always should do. It drags itself to the front of your mind despite attempts to think about other things. It transcends rational thought. It becomes everything. Sound familiar? Sounds an awful lot like being a Mets fan. And it is, I’ve learned. Sometimes, they’re even the same. I took her to her first Mets game a few weeks into the 2017 season, her first baseball game ever besides the Red Sox game we’d been to the weekend before. They lost. We’d come back twice more in August before she’d get her first win. By then there weren’t too many players left from the 2015 team that I’d fallen in love with on a whole new level. Cespedes was there, and Conforto, and Flores, and Rafael Montero doesn’t count. But besides that? It was all newbies. Rookies and free agents and Hansel Robles. And I loved the team on the field ever bit as much as I had two years before. Transcends rational thought — check. What else would you call it? We fall in and out of love with individual players we’ve never met, based on who they play for or how they’re doing, which can change from one inning to the next. We stake our health and happiness on the outcome of the game on the field, the game we’re not good enough to play anymore, but we’re happy to watch. Sometimes, it’s frustrating; sometimes, it’s downright painful. But we keep at it. And everyone who’s reading this knows exactly why we do it. We keep at it because keeping at it makes the result worth it, no matter what that result may be. It’s a logical fallacy in its finest form. But here’s the thing: we’d never in a lifetime stop, even if we could. Who wants to live in a world without anything illogical? For everything completely inexplicable, midnight frenzies for book releases and millions of fans of baseball teams and walking aimlessly in the woods simply because you enjoy the person you’re with, there are millions of stories of people made happy, inexplicable and illogical as it may be. Which brings us back to love and being a Mets fan. I sent her a Mets cap, and bought her a Conforto t-shirt, her favorite player. It’s important to have a favorite player, I told her early on; David Wright will always be mine, but you gotta pick your own, whether it’s David Wright or someone else. She’d never seen David Wright play; still never has, in fact. Travis d’Arnaud won best-looking, edging out Brandon Nimmo, but overall favorite came down to a different set. And after Walker and Reed left, Conforto officially secured the honor. In turn, she took up the Mets on her own time. Early on, she’d picked up on my thing for David Wright. The giant David Wright head I displayed on my wall may have clued her in; I never thought to ask. When we’d been texting, early on, she’d briefly thought I was gay — when I talked about David Wright. It goes to show, I guess, that she’s incredibly perceptive. She read Greg Prince’s memoir, one of the great Mets companions of all time. For my birthday, she gave me an enormous Citi Field puzzle that we assembled on the floor under my bed. She also ordered me a Mets t-shirt — but it came in the wrong size. So she kept it for herself, and got me another. So sometime around then, when I found myself asking what love really was, I had two definitions. First it’s a ballclub that can tear you down and lift you right back up again, a team that brings together old and young in mutual celebration and despair. It’s a team that sometimes wins and sometimes loses but always gives everything it has; a group of players working together to bring a trophy back to Queens, unlikely as it may seem; a collective conscience that tells us to stand with two strikes and two outs, to applaud when a pitcher leaves the game, and to forgive Daniel Murphy for leaving, since it really wasn’t his choice to make. Love is a team in Queens that will always be there for us, even if we’re not there to watch it, and love is why we’ll always come back. And it’s other things too. Love is someone who appreciates good food like Ralph Kramden, a good baseball story like Roger Angell, a fun game like Seth Lugo, and good fundamentals like Keith Hernandez. It’s someone with a sense of adventure like Harry Potter and a sense of humor like Jerry Seinfeld. Someone as loyal as Noah Syndergaard, as naive and innocent as Calvin and Hobbes, as immature as Roger McDowell, and as happy as David Wright when the Mets win the pennant. And it’s someone who understands every single one of those references. Everything was perfect. There was just one problem: she was two years ahead of me. In mid-May, I took my last exam, then went home for a few days. I took in a game while I was home, a 7-5 win over the Angels. Jose Reyes was three for four, Conforto doubled, Reed got the save. She would have loved it, I thought to myself. Then, a few days later, I was back at school for graduation. A few extra days — but nearly long enough. Soon, it was Monday morning, and the dorms were closing. She drove off early in the morning; I lay in bed for a few hours, immobile and barely thinking, almost bludgeoned by sadness, then took the train back to New York. I watched The Office the entire ride. That helped a little. I was back at Citi Field the next day for Tyler Pill’s major league debut. In the bottom of the 12th, Jay Bruce drove home T.J. Rivera for the walk-off win. She loved Jay Bruce; ever since I’d predicted that he’d be bad, and then he’d turned out ok, she’d treasured his success all the more. That RBI helped a lot. I went away to work for the Summer, and she stayed home in Michigan working, but then, later on in the Summer, she came to town again. We went to two more games; she got her first win, an 8-1 blowout, and was introduced to the pitching phenomenon that is Rafael Montero. We drove back to Michigan and spent a week; we even took in a Tigers game, marred slightly by the fact that the Yankees beat them 10-2. But all too soon, I was on a plane back to New York. Then there was a semester apart, but for a brief visit at Thanksgiving, and then Winter Break started. In the middle of all this, the 2018 schedule was released; Opening Day was Thursday, March 29th, the Thursday of my Spring Break. Did she have enough vacation days to make the trip? It appeared so. As I write this, I’m sitting at her desk in her office in her home state of Michigan, near the end of a ten day trip. We’ve seen two movies, lots of Seinfeld episodes, and a Red Wings game; we’ve escaped a room, eaten a free dinner, gone bowling, set a high score on a local arcade’s football throwing game, and gotten several incredible sandwiches. But all too soon, I’ll be on another plane, headed back home again. I hope I have a window seat on that plane, but even if I don’t, I’ll make do. And as we fly into Laguardia, I’ll gaze out the window at the ground, where Citi Field might just be visible, and I’ll think of my two loves, and of Opening Day 2018, when I’ll be with both of them again. Call all the newspapers, shout it to the world, and get David Wright in the room, because the Mets have discovered a miracle spinal solution. No, I’m not speaking literally — but almost. Jay Bruce is back, and with him, a semblance of legitimacy. The deal came together late last night in a sudden, rapid flood of information; minutes after learning that Bruce was close to a deal with a mystery team, we learned that the mystery team was us. We reacted like we always do: disjointedly. We were thrilled, quietly appeased, dejected, revolted. Some of us couldn’t quite tell why. Me, I used to get excited about deals like this, back when they were all we had to look forward to; deals like Bartolo Colón and Michael Cuddyer and Luís Castillo. Not Cespedes deals, not hundreds of millions, but not Anthony Swarzak either, not nobodies. I don’t exactly get excited about deals like these anymore — it’s more of a reassuring feeling of contentment. And I’m not even sure which is better. You know what they say about championship teams (or at least, what I say about championship teams, that I think they should say too); on offense, all you need is a lineup with no easy outs. You get that done, and you already have the advantage. It’s why players like Steven Drew and Jarrod Saltalamacchia, in one year of slightly above averageness, can bring the Red Sox to the World Series, and why Kelly Johnson and a slightly improved Curtis Granderson can bring us there as well. Sure we had the pitching — but the offense has to do something. And it starts with not giving away a single batter. Like in 2006, when we didn’t have a second baseman until Jose Valentín started hitting like a starter, and suddenly we did. Or 1986 and Wally Backman. Or 1969 and Ken Boswell. The superstars, the Carlos Beltrans and the Doc Goodens and the Tom Seavers of the world, keep the team gunning furiously for the top spot. But they can’t get there without eight hitters, five starters, seven relievers, and a bench, and that’s where the rest of the team and Jay Bruce come in. Jay Bruce won’t win us a World Series on his own. He’s a career .249 hitter with some power, some leadership, and some Texas upbringing. But what he can do is contribute. He can drive home Conforto from second with a single, or from third with a sac fly, or even see a few more pitches, so the opposition has to dig into its bullpen a batter early. Or, of course, he could hit the ball over the fence, as he’s done 69 times in the last two years, and 29 times last year before he departed for Cleveland, seemingly oblivious to the home run graveyard that is Citi Field. All of which is to say: Jay Bruce isn’t great. But he’s competent. And you can’t win until you’re competent, and stocked up with players like Jay Bruce. Put the best pitchers in the world on the mound, and bat Eric Campbell fourth and John Mayberry fifth, and we’ve all seen what happens. But Jay Bruce and another competent bat…well, now we’ve got a chance. Not that a chance is all we should have, or all we deserve; I don’t mean to say we’ve done enough, and in fact, I mean the very opposite. We should do more: more like this. More hitters who can hit and pitchers who can pitch. If we don’t do more, we may well be sunk; Jay Bruce can’t bring a team back to competence, let alone competition, by himself. But he can contribute, and that’s all any one player in this wonderful game of ours can do. Baseball’s a team sport — the ultimate team sport. You get on base, and unless you can steal the next three, there’s not much you can do. So you need teammates who can help you out and bring you home, but they can’t all be superstars. Some of them are just going to be Jay Bruce: hitters who know how to hit and work hard at it, doing their best to win and not usually thrilling, but sometimes succeeding. Sports are known for their players, and among those players, the best ones stand out: it’s unavoidable, and not at all undesirable. But sometimes, it also makes us forget how the game works. Three or four players can do the bulk of the work for a team, but they can’t do it all: they need the rest of the team’s help. And Jay Bruce, and players like him, the guys on deals that aren’t too short but aren’t too long, who can hit and throw well enough to help out, are happy to provide the help. Jay Bruce will do his work, have his occasional moments, and help our team as much as he can, quietly, along with hundreds of other players like him, serving as the backbone of our national pastime.